Mistress MacKenzie and her flying squirrel, Archie! Who Is Mistress MacKenzie, anyway? Only the HOTTEST thing to come out of Strathbungle like, ever! Mistress is an elderly woman who lives in the remotest part of Scotland, Strathbungle. She runs a small dairy farm and a possibly haunted guest house, The Midgie View. In an attempt to somehow communicate with the outside world, she has set up an old Ham radio in her Garden Shed, where she broadcasts home school lessons to the children of the isolated communities. However, her knowledge on life is drawn from folklore, fairy tales, the gossip in the village and the angry Old Testament. My character-based sketch show, The Shark’s Mouth, enjoyed a four-week mini-series on BBC Radio Scotland in 2013 and one of the characters, Mistress MacKenzie, was commissioned for a half-hour sitcom. 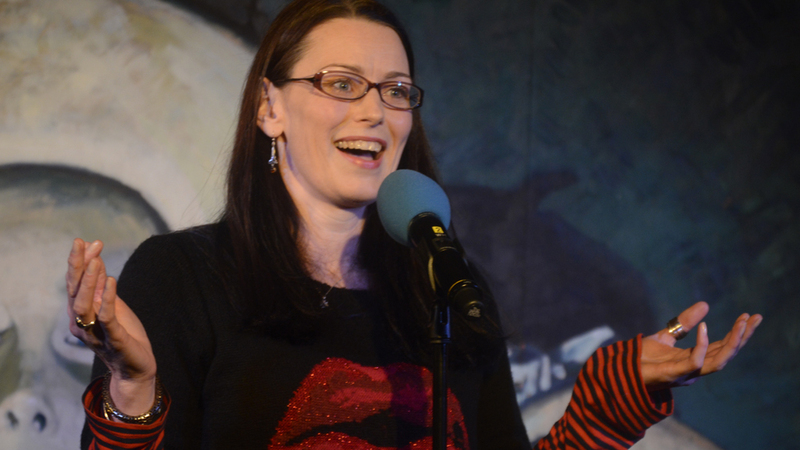 Mistress MacKenzie and Friends was produced by The Comedy Unit and aired on BBC Radio Scotland in October and December 2014 and was also featured on various radio Scotland programmes including Christmas Crackers, Feeling Kind of Funny and The Janice Forsyth Show. Mistress MacKenzie has also appeared LIVE at The Stand Comedy Club, The Netherbow Theatre, Lach’s Antihoot, The Edinburgh Festival Fringe, The Glasgow Comedy Festival, The Brighton Fringe, The Leith Festival and The Tron Theatre. We are now in development for a full series for Mistress MacKenzie as well as a live theatre show. “Keara Murphy’s show is a character-based comedy show dealing with four women and their perceptions of love and men. Poignantly funny in places, dark and sinister in others, Murphy moves skilfully from one character to another with ease and interweaves the story of an Irish woman looking for love, a repressed tennis club president, a Glaswegian harridan and a failed nightclub singer (who is humorously, constantly interrupted by the club announcer). The stories’ endings lead to a whole new set of questions and possibilities for the characters, and it is to Murphy’s credit as an actress and comedian that she makes us care about what happens to them after she leaves the stage.